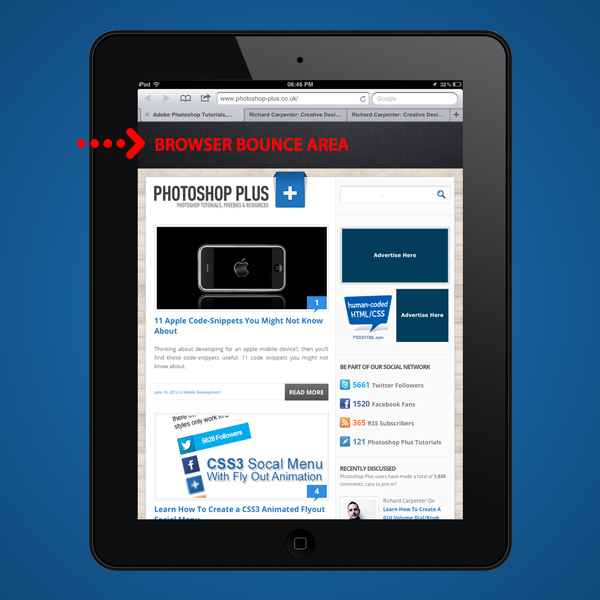 IOS Browser Bounce, How To Disable It! When your browser in the iPad or iPhone browser you will notice when you reach the top or bottom of the page you get what i call the browser bounce. This is when the page finishes but the browser carry’s on and bounces back down. In a recent iPad web App i have been developing i found it pretty annoying, i want the web App to feel like a web App and not like your in the browser. With this little code snippet you can disable it. Simply stick the code snippet within the head of your document and your done. No more bouncy window. Thanks for sharing this code, it is going to be a great help to me in the future when I am developing a mobile website. I was wondering whether it is possible to use this and then have a scrollable div? I was thinking of maybe using this on a website where I have got a fixed navigation menu at the bottom but with all the content above it, which you would be able to scroll to see it all?